Our Providence Frame is just simply stunning. It works well for our larger oil paintings being just over 4 inches wide. If you like this frame and have commissioned a smaller portrait, we have some narrower frames very similar to this too. Just email us if you would like to see samples and we can email you photos of a few different versions to view. If you are looking for a wow factor, something beautiful, solid and heavy, the Providence frame exudes quality. Just by picking this frame up and holding it, you can feel its quality and craftsmanship. All of our Providence frames are hand made to order, bespoke for each client and if you order this frame, we know that you wont be disappointed. We absolutely love it. 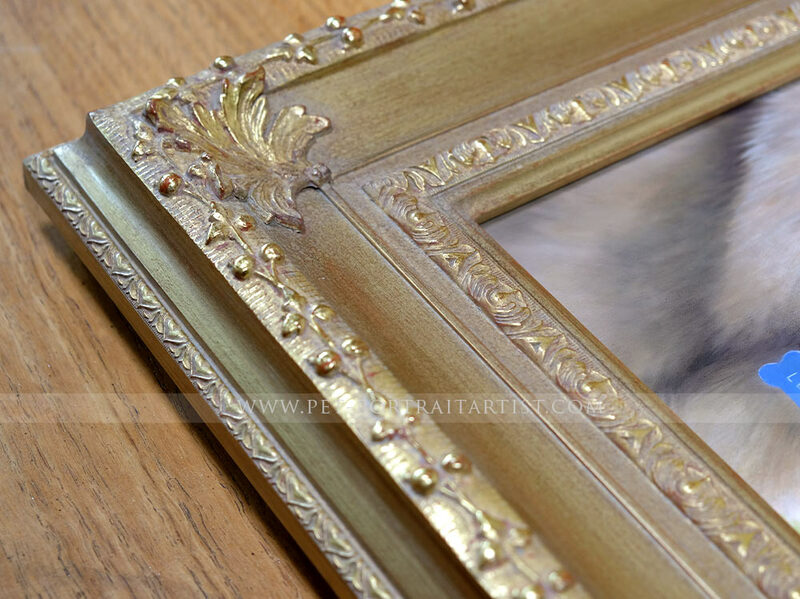 The Providence frame is Gold Leaf and Bronze and the colour of the frame is rich and warm and not at all overpowering. It is a lovely delicate colour which isn’t too vibrant. 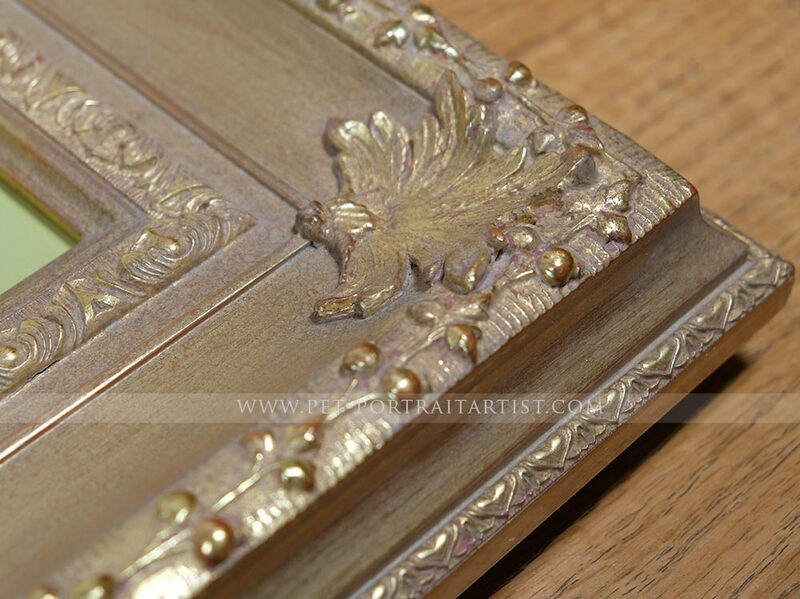 It will work with most home décors and will draw the eye to the painting beautifully. Would work stunningly over a fireplace. 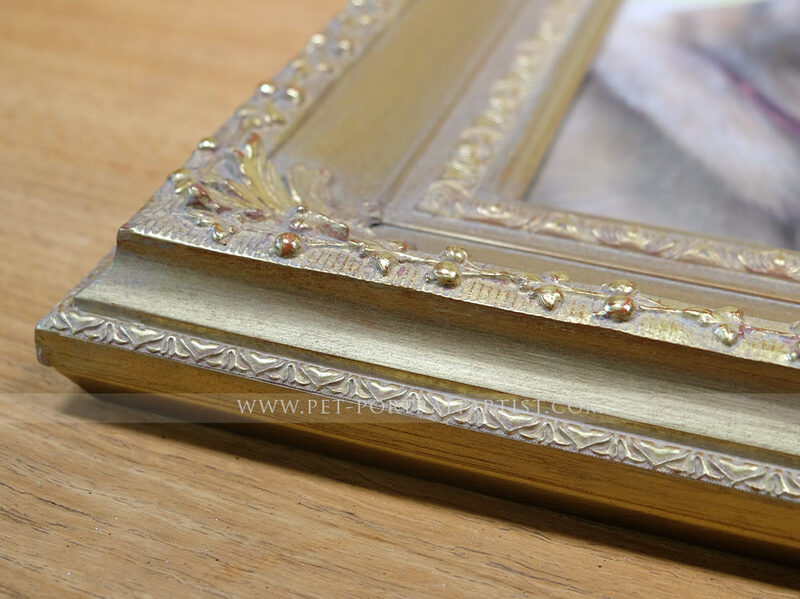 The Providence frame has three areas of detail, the outer detail on the side of the frame is a pattern similar to the inner detail which helps draw the eye into the painting. The main area of pattern is a leaf and berry design drawing the eye into the corners where you have a beautiful leaf design. This covers up the mirrored corners so you never see any joins on this frame. 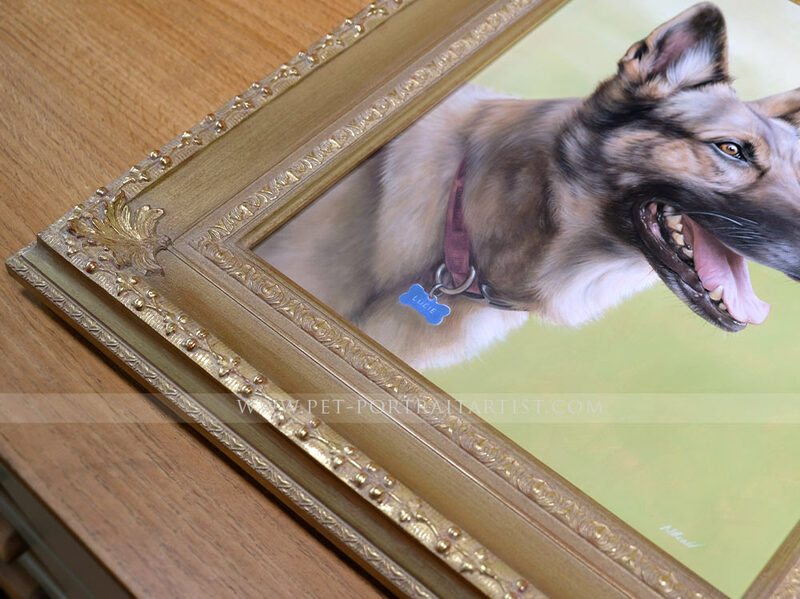 We hope you enjoy viewing the photos below and if you would like to order this frame for your portrait, please don’t hesitate to contact us via our pet portraits contact page at any time. I think it's perfect. I just LOVE it!!!!! I am so excited and don't know if I'll be able to wait til Jim's birthday at the end of Sept. to give it to him. 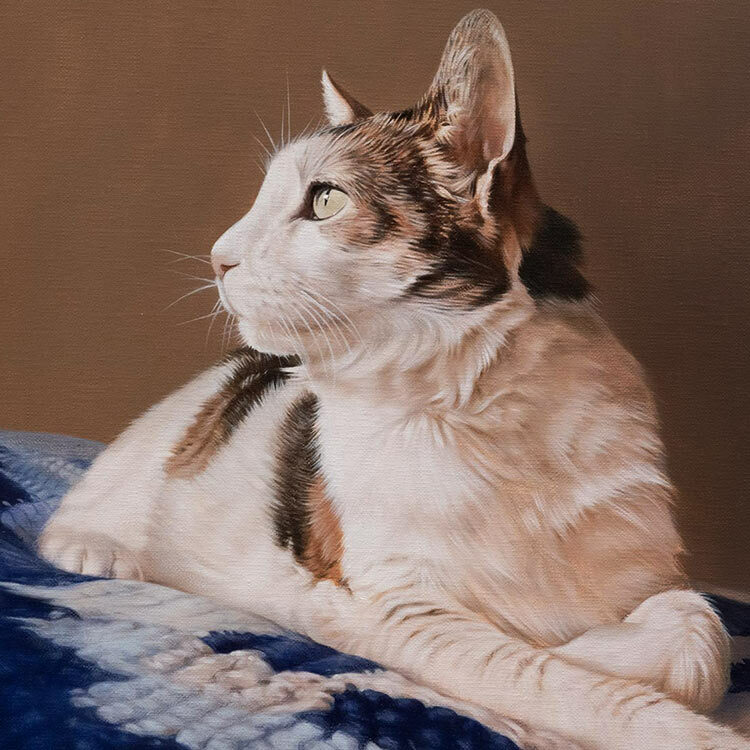 Thank you, thank you, for this lovely portrait of our dear dear old man. 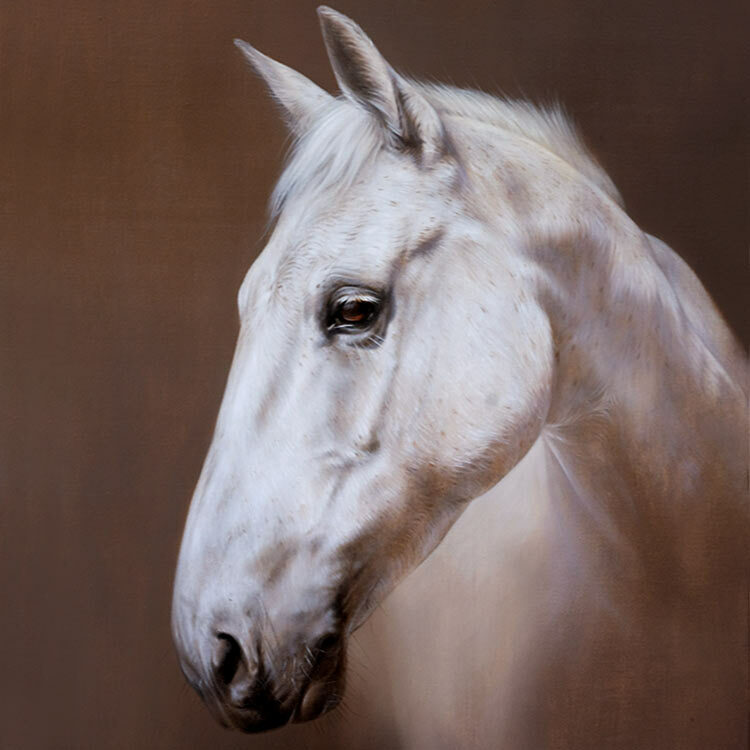 Our Regent is a stunning frame for our oil paintings, suitable for our pencil pet portraits too!